This stunning apartment is located in New York. It has wonderful décor and a touch of the 70’s, fashioning a unique and intriguing design. The sofas are so luscious in this space. The neutral colors warm the open plan, and the suede and leather pillows are fabulous. A dark table provides a place for a gorgeous floral arrangement and fabulous books, and a neutrally colored area rug sits on the dark hardwoods. The flowers in the window are delightful. 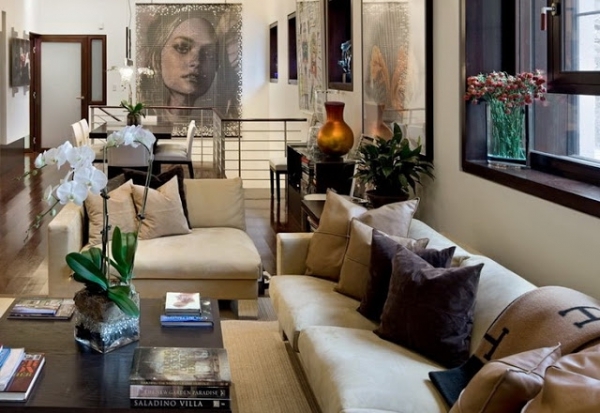 The open plan is phenomenal, and perfectly framed by the huge artwork near the steps. We love the blue divider, it adds a healthy dose of personality to the design. The square shaped windows are unique and beautiful, bringing a lot of interest to this stunning apartment. 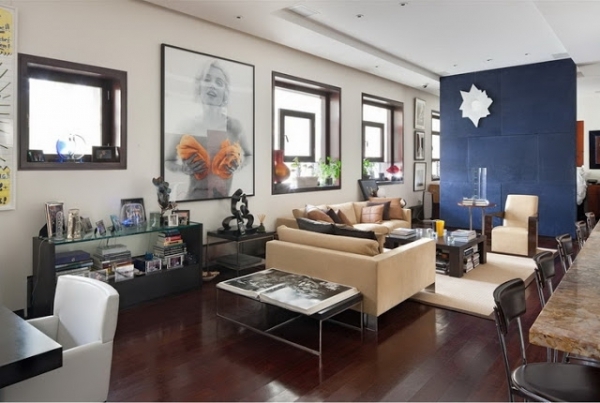 A large Marilyn Monroe photograph and alluring sculptures and décor adorn this area, completing this magnificent space. 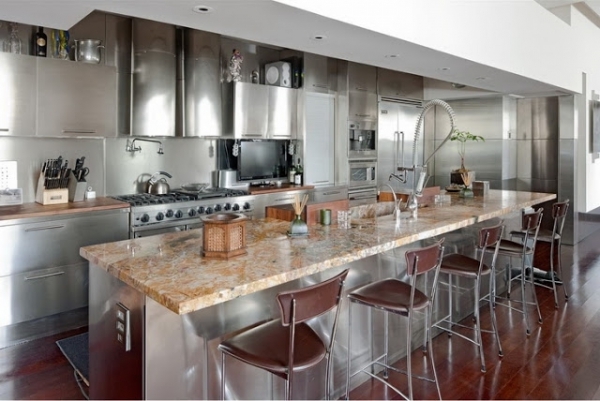 The kitchen is definitely luxurious with its marvelous countertops and professional appliances. The stainless steel is warmed by the chocolate hardwoods, the sleek stools with brown leather cushions, wooden accents, and the countertops. There is an awesome amount of storage in this beautiful kitchen. You can really see the beauty of the windows in the bedroom, simply gorgeous. 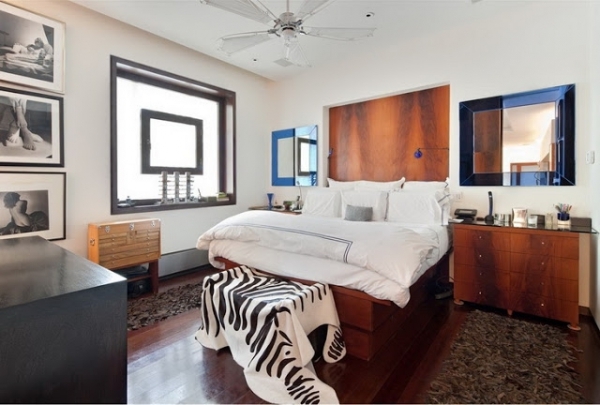 The bed is framed by a wooden feature wall. The feature wall matches the wood in the bed frame and the dresser, bringing a cohesive feel to this design. The area rugs add wonderful texture, and the black and white throw covering the bench, brings a strong contrast to the room. 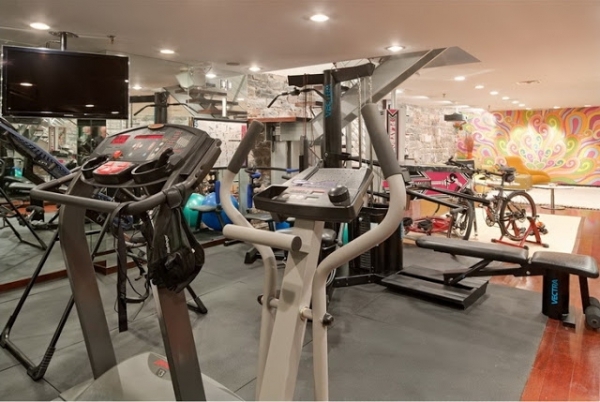 The photographs on the wall are radiant, and the mirrors open up the space even more. The blue and white countertop in the bathroom is unlike anything we’ve ever seen before: positively lovely. 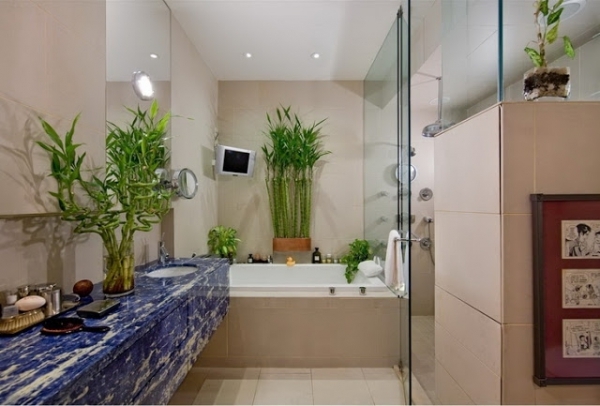 The plants are interesting and good-looking, bringing a tropical feel to this relaxing space. 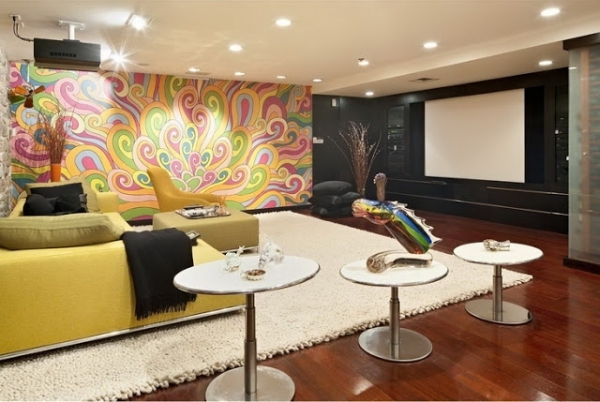 Do you like the 70’s influence?